The Dogs and Kids Program is a web based resource originally developed by The Royal Children's Hospital Safety Centre, Melbourne, Australia. The Program promotes dog bite prevention and socially responsible dog ownership. A one page promotional flyer with key messages is also available as a hard copy hand out from The Safety Centre. The Dogs and Kids program began in 1997 as one of the first initiatives in Australia to specifically address injuries to small children from dogs. 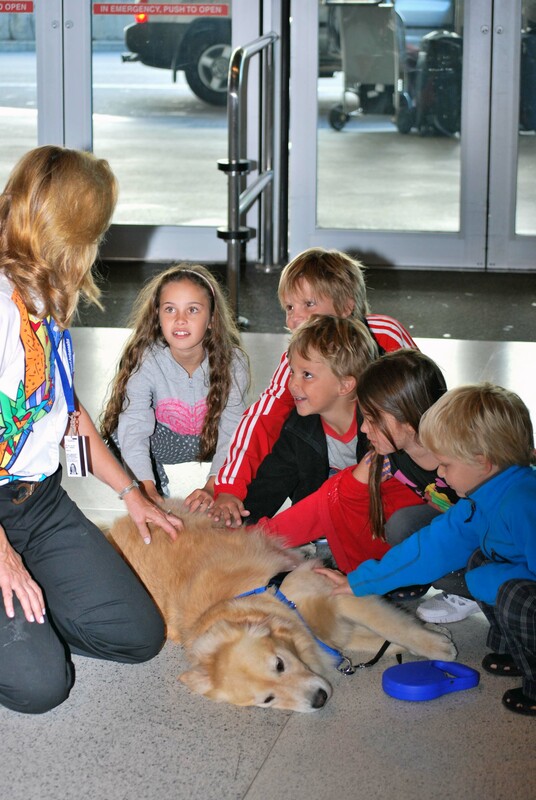 Download this resource to assist safe, close and enjoyable interactions between our children and our pet dogs. Download and print the English version of the Dog bite prevention poster (PDF) to promote dog safety at your workplace or home. Languages other than English are available on our "For Health Professionals" page. Recent research has found dog bite injury accounts for 1,628 emergency department presentations per year in Victoria. Two year olds are at highest risk. 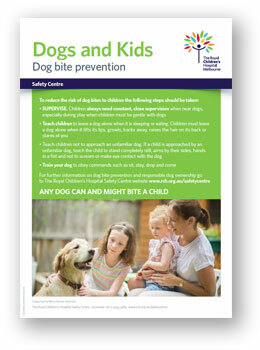 dogs ‘n’ kids addresses dog bite injury to children by teaching and promoting appropriate behaviour around dogs. The kit includes a comprehensive booklet, brochure and poster that is provided free of charge across Australia to health professionals and parents. Veterinarian and animal behaviour specialist Kersti Seksel discussed the benefits of growing up with pets and offered advice on how parents could help their children and dogs to interact safely. She said it was important for children to understand that a wagging tail did not mean a dog is happy, rather that it is willing in interact. And dogs, like humans, did not like strangers patting them on the head. dogs ‘n’ kids is produced by the Royal Children’s Hospital Safety Centre and made possible with expert information and funding from the Petcare Information and Advisory Service. The project was introduced in 1997 and was one of the first initiatives in Australia to specifically address injuries from dogs in small children. Since then, thousands of booklets and hundreds of thousands of brochures have been provided free of charge across Australia to health professionals and parents. ‘We understand growing up with pets is a wonderful experience for children and their families and many of us have enjoyed having pets ourselves,’ said Royal Children’s Chief Executive Officer Christine Kilpatrick. ‘Our aim is to minimise the risk of dog bite injuries by giving health professionals and parents relevant information to help them do so,’ Professor Kilpatrick said. dogs ‘n’ kids has been translated into Turkish, Arabic, Italian, Mandarin and Vietnamese.